Samudra beach which is a scenic jewel to Kovalam is located towards the north most region of Kovalam beach. This is separated from other beaches by disjointed fissures and giant promontory. The beach has enormous attractive features among which the most prominent is its isolation and the feel of serenity it offers. You will never find massive crowd of tourists pouring in here. This feature alone draws lots of tourists towards the beach as they can be away from the noisy howls and rushes of their routine city life. 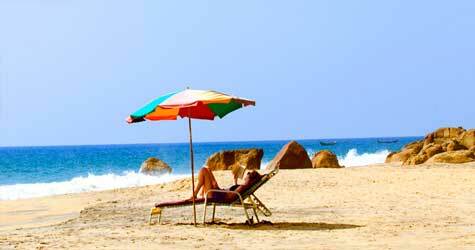 You can enjoy complete privacy here and thus this beach has always remained as an ingredient in almost every honeymoon packages in Kovalam. This is an absolute paradise for the newly-wed and they can stay immersed in their own world of tranquillity here. Samudra beach has remained impervious to the rapid bloom of tourism and even today the beach is successful in preserving its original appeal. Even though Kovalam tourism has flourished to larger dimensions, the beach has remained unnoticed mainly because of a huge ridge present in between the north and south coastlines. Since the place is not always crowded by tourist population, this part of coastline is preferred for fishing by the local fishermen. Here you can see some wooden fishing vessels and the view of ships far away on the horizon will surely be a sight which you will enjoy watching. You can simply sit on the sea wall and appreciate the majestic view from there. Delight yourself with the visual grace of squashy waves which quietly hasten against the hard rocks. The abundance of coconut trees and palms in this beach augments the beauty and regulates the climate perfectly suitable for tourism. 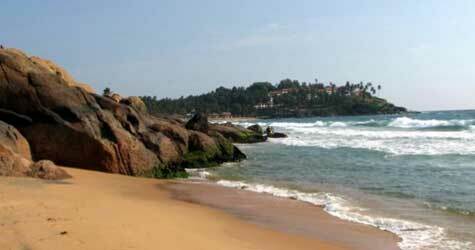 Another factor boosting the scope of tourism in Kovalam is the presence of different options for stay. This not only include any high class Kovalam beach resort or hotels but you may also find cheaper home stays here by the local people. Home stays are run by the local people here and you will get an exact feel of a temporary home away from your own home. However choosing a Kovalam beach hotel would not do much harm to your budget as the rates are genuine and affordable. You will be provided with superb rooms to stay, delicious dishes and much more than you can ever imagine. Almost all hotels and resorts in Kovalam have indoor games and leisure activities which always keep you engaged. Also there will be well equipped reading rooms with wide variety of books and magazines. There are many other tourist places in Kovalam which can be easily reached from the Samudra beach. Ashoka beach is yet another beach which lies very much close to Samudra beach but it is not much popular among tourists. As Samudra beach is located close to Trivandrum, the capital city, it is not a big deal to access Samudra beach. 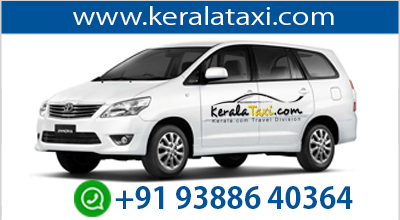 Once you reach Trivandrum by air or rail, you may prefer hiring a taxi or auto-rickshaw for convenience. However, bus would be the cheapest option.